Leduc Physio is happy to be in a position of expansion. We are currently seeking a kinesiologist to join our ever growing team. We are looking for someone who is ready to take on a new challenge in an ever growing and expanding field. The candidate will be trained on physical therapy aide tasks such as hot packs, cold packs, IFC, TENS, Ultrasound, and NMES machine. The candidate will be responsible for 1 hour exercise sessions with clients. The candidate will be trained on how to use our exercise software, keep proper documentation on the client, and retain clients. The candidate will be involved in actively seeking out new clients for these programs. The candidate will be solely responsible for creating and implementing group exercise classes. The candidate will be involved in the marketing, and promotion of these programs. The candidate will also be responsible for proper documentation and safety of clients involved in the programs. The candidate will be trained to fit for compression stockings. The candidate will also be responsible for ordering, purchasing, and client follow up. The candidate may also need to provide the client with insurance information and coverage options. The candidate will be trained to educate and fit clients for bracing, including how to use the CCMI to fit for custom knee braces. The candidate will be trained on all of our sundry items that we carry, and how to properly educate clients on how to use them. The candidate will be trained to learn how to fit for both custom and non custom orthotics. The candidate will be involved in the entire process, from scanning the client, to checking insurance, to ordering the orthotics, to following up with clients after their purchase. The candidate will be trained to apply athletic and kinesiology tape to clients as they see fit. The candidate will be trained to learn how complete functional capacity evaluations on clients. The candidate will be involved in actively seeking out new business. The candidate will be responsible for organizing and arranging our tent to be set up at local sporting events and local expos in the Leduc Area. The candidate will seek out the venues, organize staff to work the events, be responsible for marketing for the event, and for set up and take down of the event. 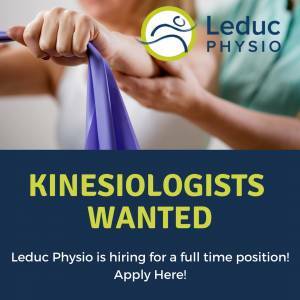 The candidate may be involved in other marketing ventures for Leduc Physio such as hosting classes at local gyms, or other promotions that arise. A college degree in Kinesiology or equivalent. Ability to actively look for ways to help people and being aware of others’ reactions and understand why they react as they do. This is a full time position. Details regarding hours and rate of pay will be discussed in the interview. If you would like to apply for this position, please email your cover letter, resume and 2 references to tenielle.magee@leducphysio.ca. Candidates are welcome to apply within the dates of October 27, 2017 – November 6th, 2017.